Every class I speak to has a different dynamic. Aside from age and geography, there are other variables such as social fabric/personalities, ranges of interest in marine sciences, topics already covered in their curricula. These variables can sometimes determine how fast I make connections and get students engaged in the conversation. This is why I work with teachers in advance to get a sense of the class dynamic and ensure I weave my message into content the students can relate to, either because they have already covered some of the material, or are about to do so. Such was the case this week when Jennifer Halstead, One Fish Foundation’s intern, and I visited Thornton Academy in Saco, Maine. We had the pleasure of speaking to two groups of seniors. One was a group of AP Environmental Science students already conversant in eutrophication, ocean acidification and thermohaline circulation. 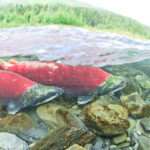 That background knowledge allowed us to dive deeper into issues around environmental impact of industrial aquaculture such as algal blooms (see Chile in 2016), net pen escapes (see Cooke Aquaculture last August) and feed (see West Coast of Africa…ongoing). 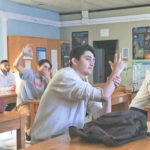 The key to successfully engaging students in the discussion about seafood sourcing and personal choices is connecting them emotionally to the narrative. When students care, they join the conversation and carry the salient points with them going forward…hopefully. 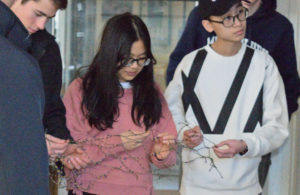 As Jennifer walked the environmental science students through how ocean acidification can impact shellfish ability to calcify protective shells, they immediately connected with the images of larval sea snails and blue mussels, both clearly compromised by more acidic waters. 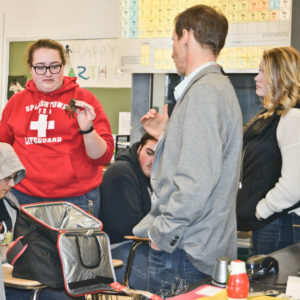 Students in the senior marine science class engaged in the discussion about why European green crabs are capable of significantly shifting ecosystem balance. Naturalized “residents” in North America since the early 1800s, green crabs are everywhere. You can scarcely turn over a rock without finding at least one along New England coasts. They are fertile (students were surprised to hear that one female can lay up to 190,000 eggs in its lifetime), hardy (they seem to be adapting to winter and changing their spawning habits) and very destructive. They are also voracious eaters. While handling some live crabs, students learned that one crab can eat up to 40 mussels in a day. To get to larval mussels, clams and oysters, green crabs tear up vital eel grass beds, which are precious nursery habitat for a host of species such as hermit crabs, sea snails, other shellfish and even smaller bait fish. Can you eat this thing? Well, yes, but not easily. 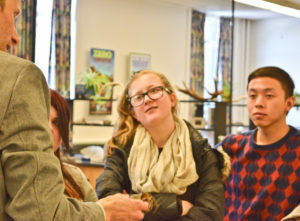 Students asked good questions about what we are doing to try to become the predator that keeps green crabs in check. 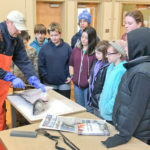 They learned some chefs make seafood stock with the crabs, while others are working with researchers from the Island Institute, New Hampshire Sea Grant and the Massachusetts Department of Marine Fisheries to determine when the crabs molt. Doing so would help them harvest crabs to cook up as tasty soft shell crabs, just as you’d find in the south. In both classes, we discussed some of the challenges fishermen, scientists and policy makers must address in ensuring different seafood stock health in the face of issues like climate change, bycatch, industrial scale fishing and aquaculture and environmental impact. 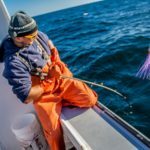 And as we discussed how the fast changing Gulf of Maine affects local species and introduces new invasive species, we also discussed ways the industry is adapting to these changes. Rather than rob students of hope, we talked about our need and ability to adapt to, not solve, climate change and its impact on seafood in the Gulf of Maine.